Wow! Apparently, we have a small contingent of fans in Nepal! Or course, they are not there for NASA EDGE. 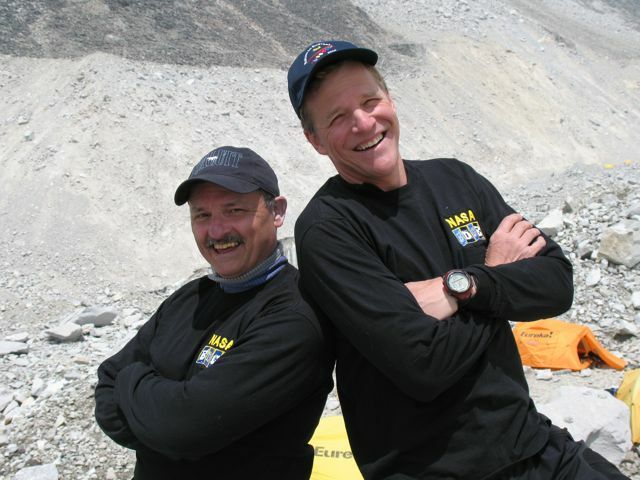 These two Everest Insiders and Outsiders are at Mount Everest base camp preparing to make their epic ascent to the summit. You can follow their progress, along with their entire team, at http://OnOrbit.com/Everest. And even though they have their very own goofy co-host, we expect nothing but success. Congratulations to the 2009 Mission Madness winner – Superpressure Balloon. The Balloon Program Office is based out of Wallops Flight Facility on the eastern shore of Virginia. They did a great job of rallying their fan base to dominate the competition. Mars Rovers, Mars Odyssey, Expedition 1, Orion, New Horizons, and SOHO all fell victim to the mouse clicking of the SPB troops. I thought Orion had a shot to deflate SPB in the quarterfinals but they stopped voting on the second day around 6:45 PM. Then when New Horizons took a 2,500 vote lead going into day 2 of the semifinal round I thought for sure SPB was done. Not so fast my friends. SPB did one thing that none of the other mission voters were able to do and that is play each round for the full 39 hours. Thank you to all who participated in the tournament, commented on the blog, and provided feedback on our social networking sites – Facebook and Twitter. We will compile all your suggestions and use them for next year’s competition. Here’s the breakdown of the votes count by round. 1. Allow the public and internal NASA to learn about 64 different missions. We tend to focus on one mission at a time. 2. Provide a fun and exciting way for the public to learn more about NASA in general. 3. Receive feedback from the public to see what types of missions they are interested in. There are a few lessons learned from this experience and I am sure next year’s competition will be even better. We’ll have a new field of 64 with great missions that didn’t get included this year. So start lobbying for your mission today so that they may have the chance to do what SPB did….shock the world. SOHO supporter answers with her own pic. What say you? SPB is so confident of their victory that they voted for their chosen opponent! No matter how you feel about how this competition has gone so far, SPB is in the driver seat, and they are daring anyone to challenge them. The only question left is whether or not SOHO can find enough supporters to vote for them for the entire 39 hours of the final round. LRO, Apollo 11, Freedom 7 all had leads going into the final hour of voting before losing to late voting surges. Even Orion was competitive until the final 4 hours of their round against SPB. SPB, soak your clicking fingers in palmolive for the weekend… wait, you guys don’t need that. You have hardened callouses. For all of you SOHO supporters, stretch, soak, rub, jazzercise… whatever you need to do. In roughly 57 hours, you’ll need every mouse, mainframe and monitor you can access to deflate SPB. Again, congratulations and good luck. And may the best* mission win. *I recognize that many people have contested the notion that this competition could actually reveal the best NASA mission. This is dramatic hyperbole for the sake of inspiring enthusiasm and the spirit of competition. 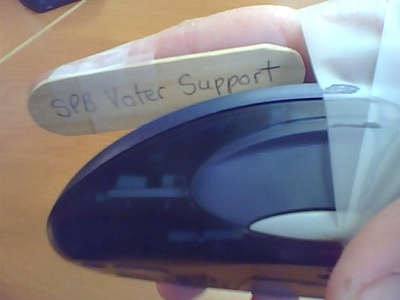 This was emailed to me from an SPB supporter. Apparently this is how they are getting the job done. SPB, New Horizons, LRO and SOHO All Advance! I’m speechless. My bracket is trash, I am 0-4 when it comes to picking against SPB and no one at JPL will speak to me. I guess I will leave the analysis up to those who have some credibility left. The good news is that the final contests are fairly simple to size up. I would give my predictions, but I DO NOT want to take the blame for sending a mission packing.